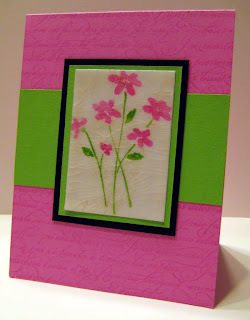 We made this 3 x 3 card in stamp club this month. 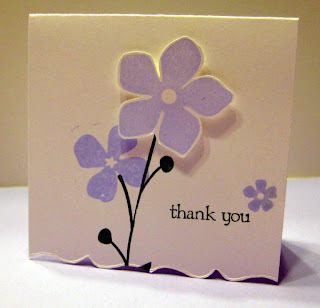 It's a simple little card, but it is just another example of the great things you can do with a Big Shot. 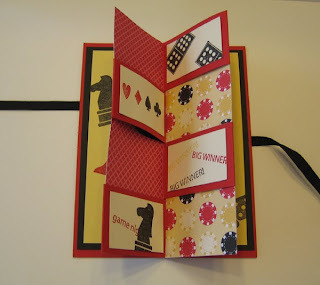 Fold your 3 x 3 card, place it on the edge of the Fancy Favor die, crank it through your Big Shot and presto - a fancy edge. I traced this edge on the envelope to make the card complete. Only a few more days to shop from the Occasions Mini catalog - it ends April 30. Here is a quick card I made using Something Sweet. It would be super cute with a treat cup and Goldfish crackers, but this option will fit into a flat envelope. Here's another Stamp Club project for this month. The Orchid Opulence card stock will be retiring June 30 but I am so happy to have this current In-Color, Rich Razzleberry, sticking around in the new color collections! 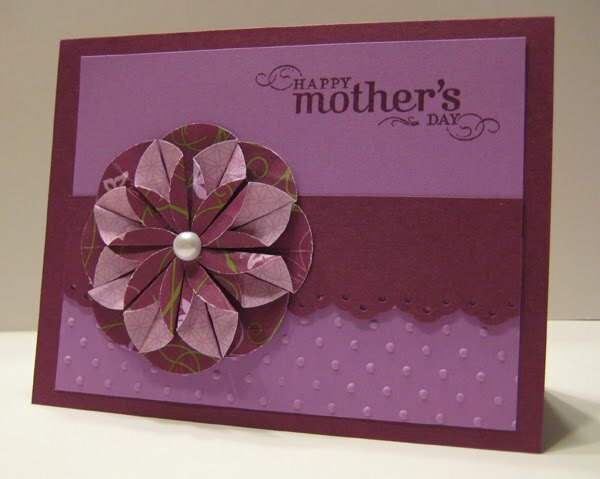 I made the dahlia fold with Cottage Wall Designer Series Paper, and topped it off with a half pearl from the Pretties Kit. 1. 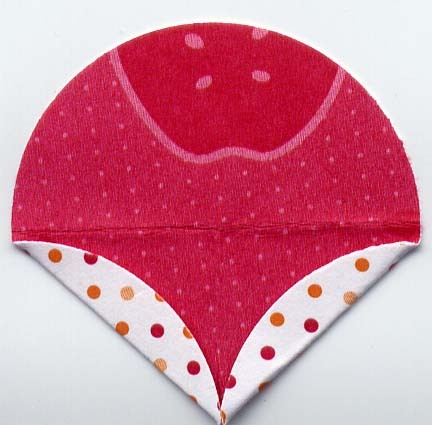 Punch 9 circles of Designer Series Paper using any size circle punch. 2. Vertically and horizontally fold the circles in half creating 4 quadrants; however, don’t fold all the way up on one fold as this will be visible as the top center of your flower. Unfold the circle. 3. Fold up the bottom right and left corners. Use your previous fold lines as a guide. 4. 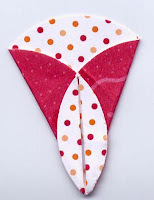 Flip your piece over and fold the right and left edges to the center. 5. Repeat for each circle. You will need 8 folded circles to make a full dahlia. 6. The ninth circle serves as your dahlia’s base. Simply fold this circle into quadrants as a guide and adhere the eight pieces with the tips meeting in the center to create a beautiful dahlia. What a fun project! You apply at least 3 layers of Glassy Glaze Enamel (found on page 188 of your catalog), heating each layer. When it is cool, you crack it by bending here there and everywhere. For stamp club, we put it in the freezer for a short time, but letting it sit over night works great too. There is something about the cracking and popping sound - kind of like popping bubble wrap. I rubbed Creamy Caramel ink over the top with a sponge to make the cracks stand out just a touch. 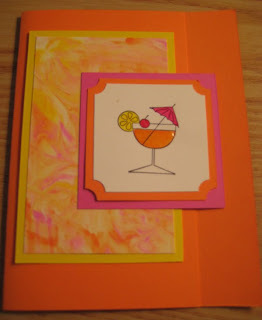 This card is a Stamp Club project from sometime last year, but I pulled it out since it uses 3 soon to be retired colors - Pixie Pink, Only Orange and Yo-Yo Yellow. 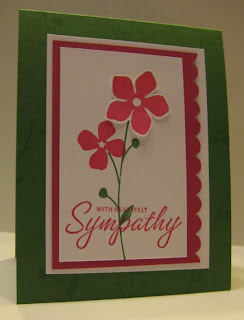 I am sure it was my inspiration for this recent card since it is hanging up in my stamping studio. To create the shaving cream background, squirt some shaving cream onto a paper plate, dot with reinkers of your choice and place your piece of glossy cardstock on top of it. When you peel it up, you will leave shaving cream on the cardstock. Wipe the excess shaving cream off and you will end up with a background similar to this one. The same shaving cream can create a few backgrounds before you will have to reink or simply replace the shaving cream and start over. 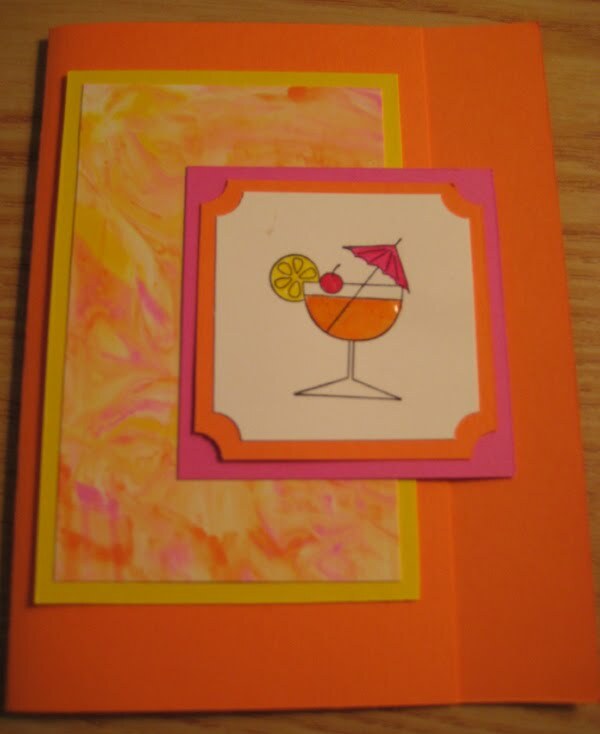 With such a unique background and Crystal Effects on the drink, it is easy to put together a striking card - even with only a small amount of stamping. I have been on a pretty lucky streak lately. This is a new set I chose when I won a prize from my upline, Meg. Then as a participant in a special Stampin' Up! program, I was randomly chosen and won another one!! So I have a couple new stamp sets, and on top of that, my pre-order for the new mini catalog (coming soon!) just came. So where to start with all of the new, fun stamp sets?!? 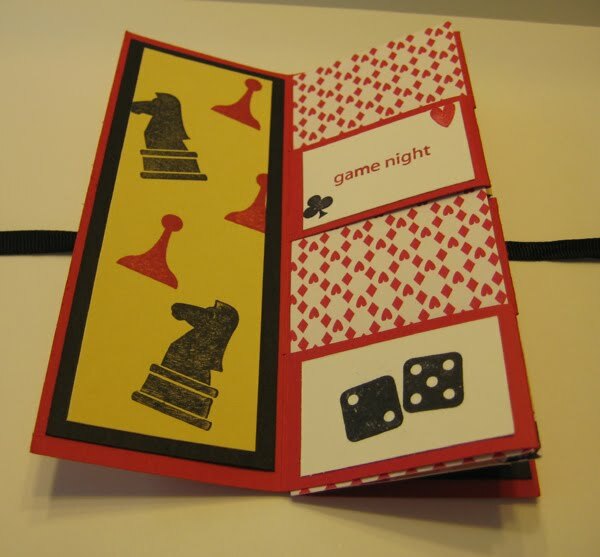 We made this Friday and Saturday at my latest Stamp-a-Stack. 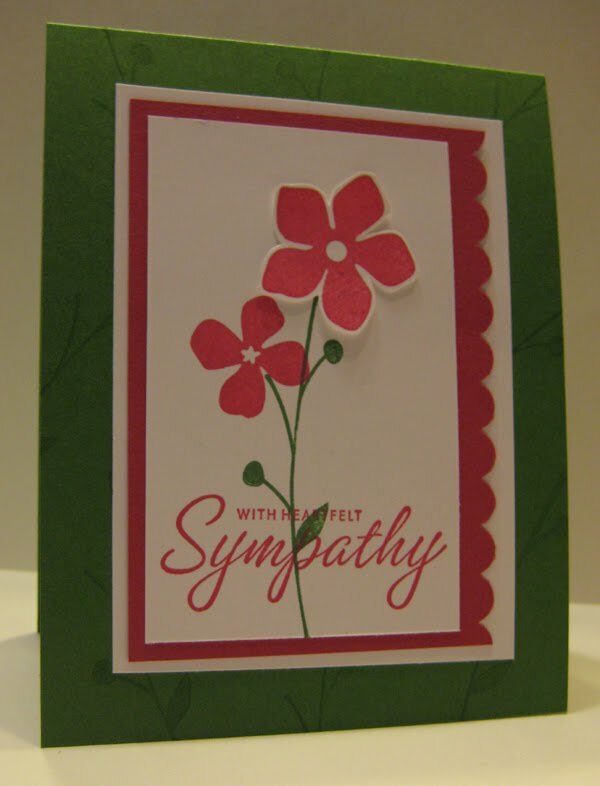 I offered Thinking of You, Sympathy, and Thank-you cards, but I designed them to be all-occasion. So I think we had some birthday, wedding, congratulations, Mother's Day etc. before the night was over. Talk about big news! 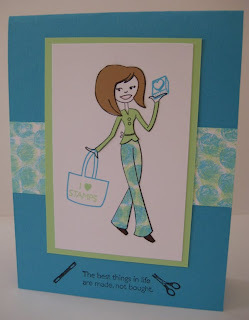 This week, Stampin' Up! announced a Color Renovation! Starting July 1 we are going to have 4 renovated collections of colors. The 4 new collections will include 5 brand-new colors and some old In-Colors. 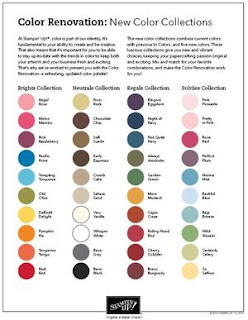 To make room for this change, some of our current colors will be retiring in June. But the other exciting news is that there will continue to be In-Color collections, but they will stick around for 2 years! So while it is sad to see some of our favorite colors go, there are lots of great new possibilities. And when you look at the new colors, I don't think you will miss some of the old colors quite as much! The following colors will be retiring June 30. So stock up on your favorites now! (They will become "while supplies last" on June 1 when the retiring list comes out). I know - it feels like a big list... but wait, here are the former In-Colors that are coming back!!!!! And we will have 5 brand-new colors! And these exciting new colors don't even include the 5 new In-Colors for this year! Stampin' Up! has worked on this change for two years and will be making it easy to transition into the new color collections without breaking the bank. I'll have more details later, but it will be possible to purchase just the new colors and there will be replacement color charts and things like that for those of us (*me*) who like things matchy-matchy. 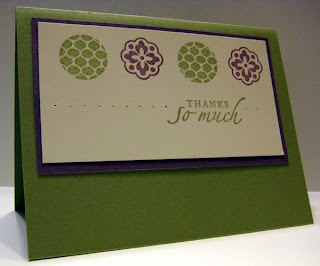 Here is my last bubble wrap card for a few days :-) This one was done with Tempting Turquoise and Gable Green. 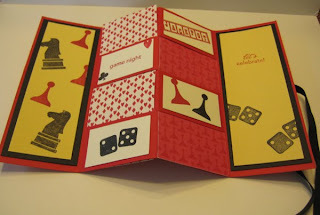 I inked and applied the colors separately and then got out my Totally Tess stamp set and did some paper piecing. Who better to wear those crazy pants? This bubble wrap card uses the small bubble wrap, but I instantly thought of this stamp set when I learned the bubble wrap technique. 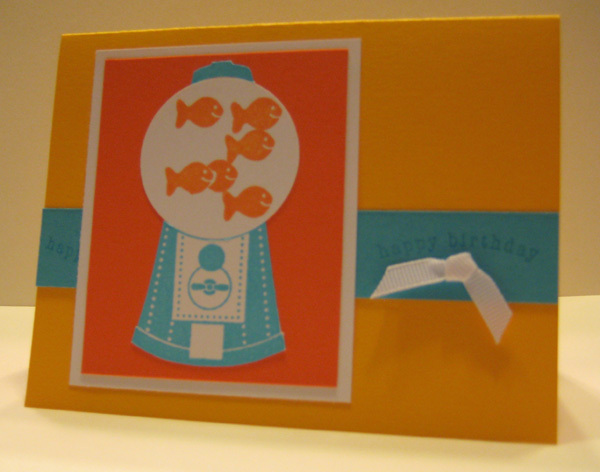 (Thanks Rae Anne for loaning it to me :-) Just like the fish card, ink up the bubble side of the bubble wrap and then place your cardstock on top and roll over with a brayer. The more you roll, the less defined the bubbles become. I like them a little blurry, but different cards may require a different touch. Did you buy the ornament punch (still available as a write in) at Christmastime? Well who knew you could use it for things other than ornaments!?! This fish uses a stamp from Delightful Decorations (no longer available), which I know many of you also bought, but I also made some with a solid color of cardstock. 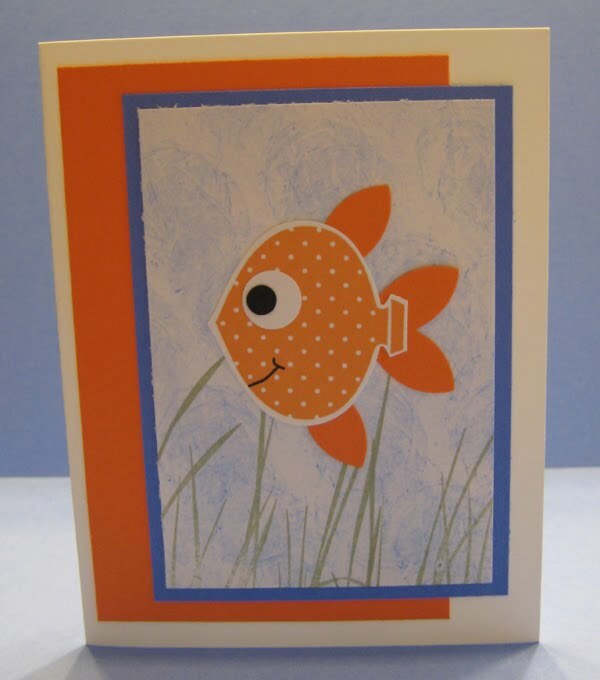 With the five petal punch, you have a fish with no trouble at all. 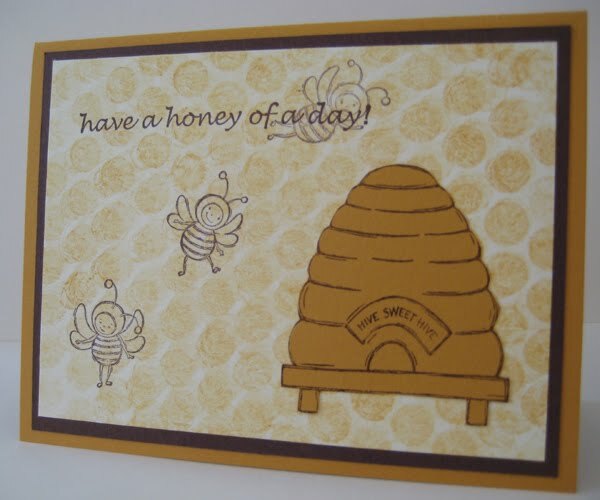 But the coolest thing about this card is the bubble background - at least I think it's the coolest :-) Take a piece of bubble wrap, ink it up by stamping the ink pad directly onto the bubble side. 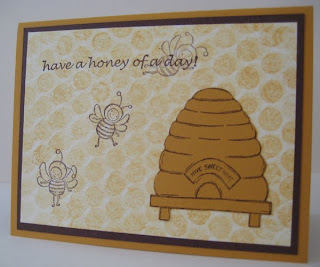 Then place your cardstock on top and roll over it with your brayer. Check back tomorrow for another sample using bubble wrap. And with a pull on the two outside flaps, it reveals an inside section. This center section is hiding a whole new section! Mine has been handled many times and it is impressive to even the biggest card skeptics! Directions can be found on Jan Tink's blog. While this seems daunting, it isn't too hard to put together, and after the first one, they go together pretty easily! 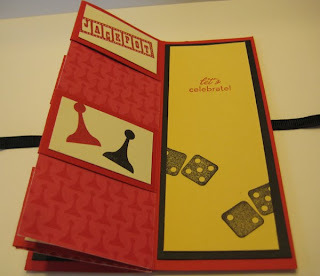 It's been one of my favorite stamp club projects over the years. I used the Fancy Favor die and then punched a 1 3/4 inch circle. I attached a small piece of window sheet with Snail to cover the hole and create a window. 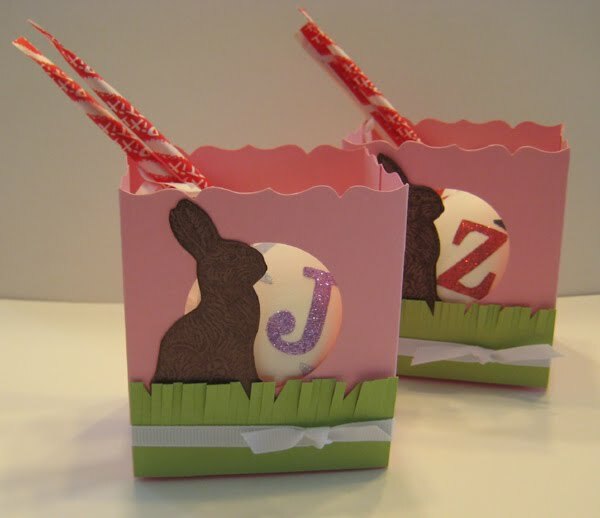 Wouldn't some pretty little foil eggs look great shining through? 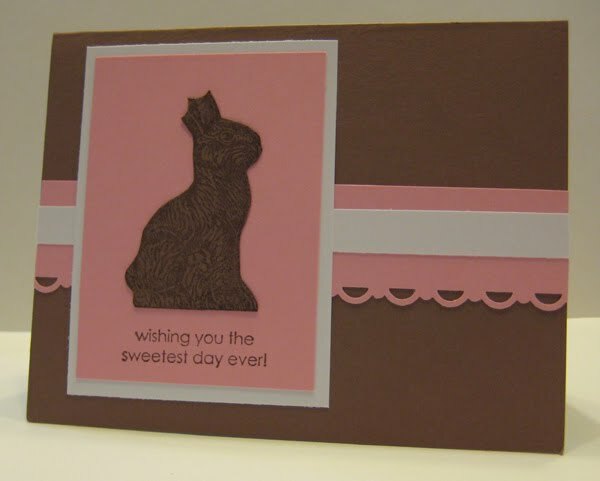 I couldn't wait to use this stamp with my scallop circle punch and copy an idea that has been floating around on Easter cards for years. 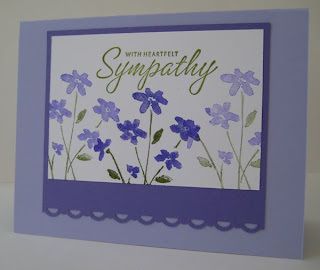 The words come from the Something Sweet stamp set in the current Occasion Mini, and I also used the Sale-a-Bration scallop trim border punch to give it just a little something extra. 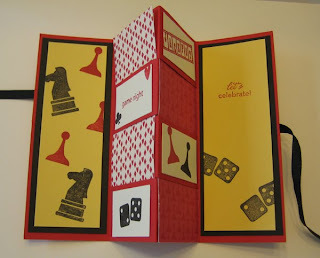 I made it for a shoebox swap with other demonstrators - talk about fun! Each person prepares all the materials for the card and we just move from table to table creating the cards. At the end of the night, I had a whole stack of new cards.